Go Back to Newsfeed One of Australia’s leading multihull specialists, TMG (The Multihull Group), is delighted to announce the addition of two brand new members to the award-winning Dragonfly trimaran family. 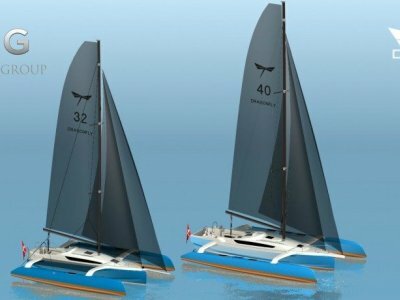 Dragonfly trimarans are instantly recognisable both at sea and at berth for their revolutionary Swing Wing system and are enjoyed by sailors all around the world. The Dragonfly 32 Evolution and the Dragonfly 40 are the stunning outcome of Dragonfly’s investment in over 50 years of building hand-crafted, high-performance, state-of-the art cruising and racing trimarans. The new DRAGONFLY 32 EVOLUTION is an exciting evolution of the popular Dragonfly 32 Supreme model, featuring new high-volume wave piercing floats for fast and relaxed sailing. The brand new DRAGONFLY 40 is the largest Dragonfly model ever built and becomes the flagship model for the brand. The spacious cockpit is designed to provide everything you need when sailing and spending days on the water with family and friends. Down below, the well-known Dragonfly style creates a stylish and modern interior.